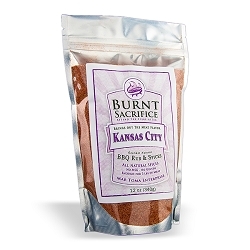 Burnt Sacrifice Kansas City BBQ Rub makes the beef taste "beefier". But is also an incredible season salt. Best on:Beef or red meat like lamb. Made for Steaks and roasts or even prime Prime Ribs. Or try it on eggs, potatoes, and vegetables. Also good on tender fish like trout or bass. Ingredients:Salt, Sugar, Paprika, Garlic, Onion, Celery Seed, Cumin, and Spices. Perfect saltiness for red meat, light in sweetness, and perfectly balanced for light bark and maximum taste. It's our quickest acting rub. It's all natural with No MSG, No Preservatives, No Gluten, No High Fructose Corn Sweetener, and No Anti-Caking Agents. We got rid of the junk to make room for more of the good stuff. 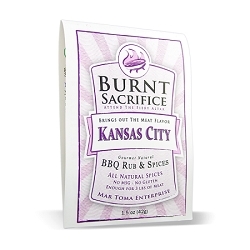 Burnt Sacrifice Kansas City Rub makes the beef taste "beefier". It is great on all red meats including lamb. It also works well on chicken, and gives a different slant on traditional ribs. Imagine the smell of lemony coriander and buttery celery seed with California garlic and onion. These all-natural spices are perfectly balanced with the salt and sugar for quick-acting flavor to bring out the inner essence of meat. And yes, we add a dash of paprika for more depth of flavor, but this is not a potato chip rub. This is about meat and the lovers of the basic taste of meat. Kansas City is a beef-town in the way that Memphis is a hog-town. It is the destination of the cattle trail that starts in Dallas. Of course they eat pork, fish, and chicken like any good barbecue town, but they love their beef. 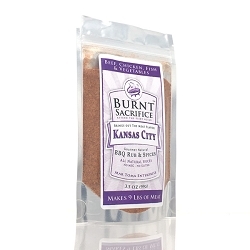 This rub is an ode to the earliest Kansas City styles with a little flourish to really bring out the wonderful taste of meat without heavily flavoring it in any specific direction. 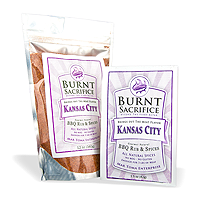 For a distinctive Kansas City specialty, try this rub on "burnt ends", the flavorful pieces cut from the ends of smoked beef brisket. Is it a rub or a seasoned salt? Well BBQ lover, you may want to switch up from the single serve to the 12-oz bag pretty quickly, because this rub really does double duty. Nearly every week my mother calls me up and tells me about something else she just put it on - from fried potatoes to eggs to whatever you would put seasoned salt on. I add some to a tuna fish sammich (you read that right I did not say sandwich) and it brings out some great flavors. Now there is hardly a time where I don't sprinkle some on my fried eggs, so I can unreservedly tell you that it is time to go deep on this rub. Every BBQ competitor and every BBQ restaurant start with a rub. The foundation of all great BBQ or grilling begins with your rub. The basic spices of the rub will enhance the flavor of whatever you are cooking, and also modify the flavor of the sauce. This gives you the effect of a different sauce for each rub you use. Try one of our fantastic Burnt Sacrifice competition-class sauces, available in several spice levels, to finish our rubs or use as a dipping sauce. Our rubs are specifically designed to be bold enough to stand up on their own so you can enjoy the flavor of the meat, but will also work well to enhance the BBQ sauce.